chicken eggs (the stuffing) — 4-5 PCs. 1. For Foundation RUB soft butter with sugar. 2. Add the cocoa. Then add the flour. Grind into crumbs. 3. Split form (for this portion 26 cm) covered with parchment and grease with butter or oil. 4. Put half of the flour crumbs. 5. To prepare the filling. All the ingredients for the filling beat with a blender. 6. Should get a smooth mass without lumps. 7. Spread curd on top of flour crumbs, flatten. 8. On top put the second part of the flour crumbs and place in a preheated 170 degree oven for 1 hour. 9. Leave in the form to cool, then carefully release from the mold and placed into a dish. 10. 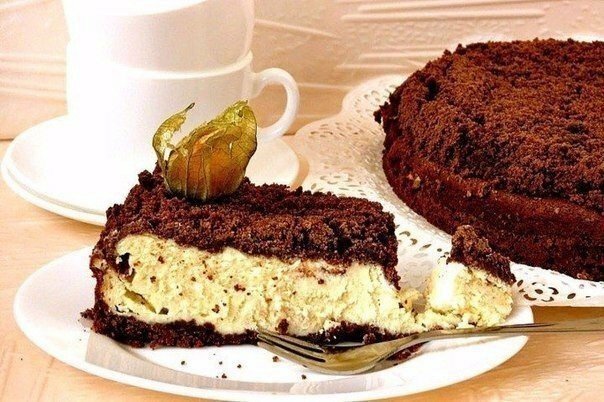 Delicious combination of cottage cheese with chocolate dough. The filling turns out very tender.